We are happy to share with you that Google Cloud Platform (GCP) is now available as additional infrastructure provider for our SAP CAL Solution catalog. Starting November 13, SAP S/4HANA fully activated including best practice content can be deployed in GCP with the same ease of use that you have seen so far for our long standing cloud providers. Once more we extend our offering in SAP CAL by providing more options to you so that you have the choice to match your business case best. How to create your first instance in Google Cloud Platform (GCP)? The description is supported by video material and more technical info listed at the end of this blog. As a prerequisite you need to a have a Google Account. In GCP console create a Cloud Platform Project. 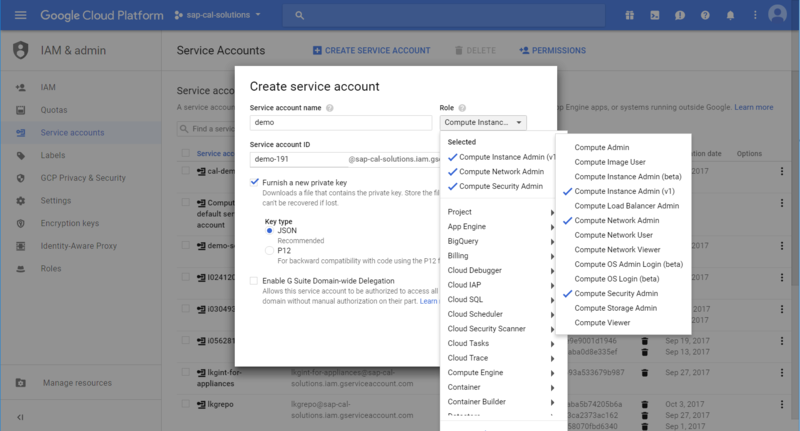 A Compute Service account and an AppService account is automatically created by GCP in your project. You have the option to try Cloud Platform for free by signing up for a free trial compute engine usage. In the APIs & serivces menu enable the Google Cloud Resource Manager API. These roles grant permissions for actions needed by SAP CAL. In the Service account generate a private key by selecting furnish a new private key, type JSON. Store it for uploading in SAP CAL Account Details in the next step. Log on to cal.sap.com, search for SAP S/4HANA 1610 FPS01 Fully-Activated Appliance in the solution catalog and create an instance. 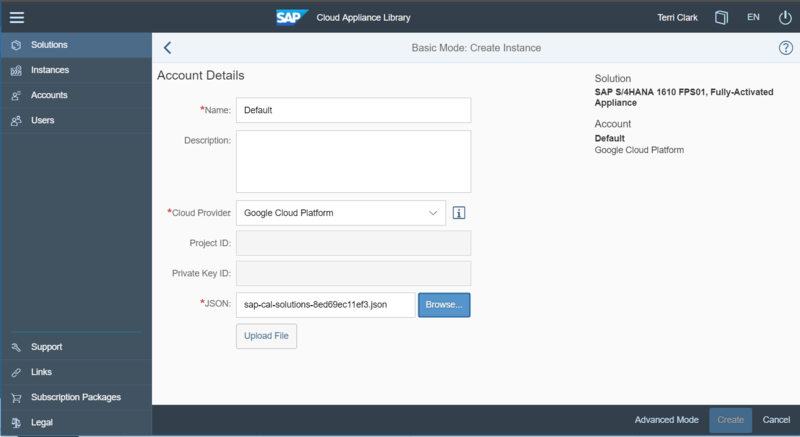 In the Account Details dialog choose Google Cloud Platform as provider and upload the JSON file. Complete the remaining info by providing an instance name, data center region, zone and master password. 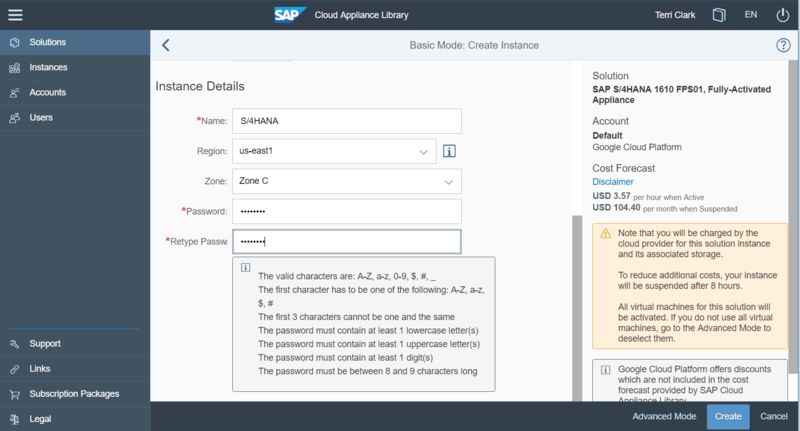 Click create and the instance will become active within less than an hour, so that you can access the frontend that is part of the instance directly via SAP CAL UI. In addition a pem file is generated that you can store locally or in SAP CAL to access the solution on OS level later on if needed. A learning video (4:48 min) showing GCP account creation and first instance launch in SAP CAL is now part of the SAP CAL youtube playlist. All info around creating your GCP account and registering it in SAP CAL is given in our GCP FAQ including links to complementary info from Google Cloud Platform. More and more new solutions will now be available for GCP deployment and marked accordingly in the SAP CAL catalog. Also the existing catalog will be offered for GCP step by step over the next months.